Kiss My Wonder Woman: Hunger Games: Catching Fire Lacks Resolution. Good. Hunger Games: Catching Fire Lacks Resolution. Good. I’m going to take a wild guess here and assume that most of you saw Catching Fire this weekend. I make this assumption based first on the fact that you’re reading a review of it right now, and let’s be real, very few people read reviews before they go see a movie. At least I know I don’t. I read them after, so that I can have opinions at things. Second, I’m making this guess because the movie did obscenely well at the box office, has already earned enough money to qualify as a hit (and earned back most of its budget) and will undoubtedly go down in history as the highest something to ever something for some reason. I don’t really care about the numbers. I do, however, care about the story. So let’s talk about that. And also let’s talk about moral decisions, the importance of failure, and how a lack of resolution can be a good thing. Doesn’t that sound like fun? 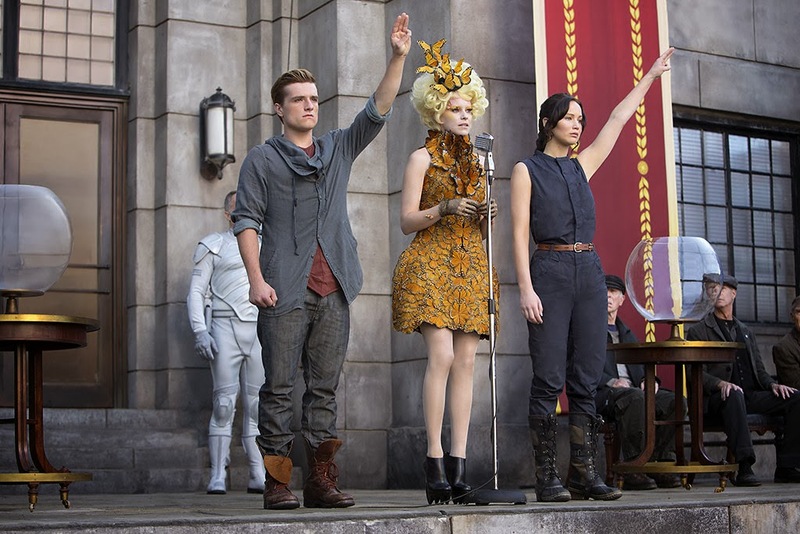 Catching Fire, like The Hunger Games before it, hews very closely to its source material. 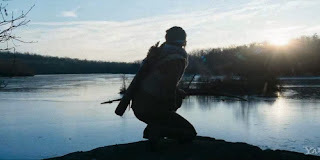 That material, of course, is the book by Suzanne Collins, part of the trilogy of books devoted to Katniss Everdeen and her struggle against the Capitol. Catching Fire is the middle of this story, the Empire Strikes Back, if you want to use a metaphor. Catching Fire is where everything goes to crap and then kind of sort of doesn’t get better. At least not for a while. The story starts with Katniss (Jennifer Lawrence) dealing with her new role as a victor and representation of the Capitol’s power. Because she and Peeta (Josh Hutcherson) won and beat the games by forcing them to have either two victors or none at all, Katniss now must prove that she is a loyal citizen and not about to start any revolutions or anything. This is problematic, as she kind of already has. President Snow (Donald Sutherland) therefore gives her a very clear command: pretend to be just a silly girl in love or prepare to lose everyone you love. So Katniss tries to comply. She can play house with Peeta and keep everyone safe. Right? Nope. Not even a little bit. As Katniss and Peeta go along their victory tour, visiting each of the twelve districts to pay their respects to the dead tributes and flaunt the Capitol’s control, the signs become more and more clear. Revolution is coming, and nothing they do can stop it now. Which would be great, if they weren’t exactly in the firing line. They try to stave off the end by making a distracting announcement, that they’re getting married, but it has little effect. If anything, it makes it all worse. Snow knows that he has to do something about this, and his solution is simple. Katniss and Peeta must be eliminated, but so too must all the other victors, in case any of them think to speak up against the games. Since this year’s Hunger Games are the “Quarter Quell” (every twenty-five years the games get a little weirder, just for kicks), Snow declares that the tributes this year will be reaped from the existing pool of victors. And Katniss, as the only female victor from District 12, is screwed. But Katniss doesn’t really care. She’s come to a simple conclusion in this past year: she doesn’t actually want to live with what she’s done. She’s ready to be finished. She doesn’t want to die, exactly, but she doesn’t want to live badly enough to kill again, and that’s kind of a thing when you’re headed into the games. She wants to protect the people she cares about—her mother, her sister, Gale, Peeta, Haymitch—but she worries that she herself is a bad influence on them. Well, maybe not on Haymitch. But certainly on the rest of them. 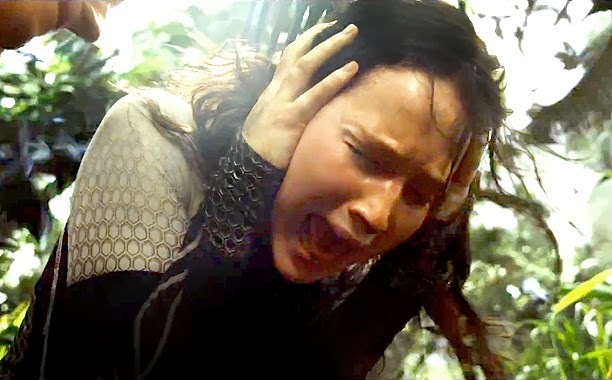 So Katniss decides that of the two of them, her and Peeta, Peeta has to live. She makes Haymitch (Woody Harrelson) swear that he’ll try to make it happen, but Peeta volunteers in Haymitch’s stead. She’s stuck going off to the games again with a boy she loves trying to make sure he doesn’t die. Which pretty much sums up the rest of the movie. Katniss is good at the games. That’s the thing they’ve never tried to hide about her character. Katniss is going to survive and fight and probably win. But what if she doesn’t want to? Katniss is the character best designed to succeed in these circumstances. So what’s interesting is to make this a story where her primary goal is to make sure someone else succeeds. And you know what? She fails. We’re not going to go into details about how or why or any of that, because I figure that you probably already know, and if you don’t then I’m not telling you. But I want to dwell on that for a minute. Katniss doesn’t actually save Peeta. She fails. He falls into the Capitol’s hands. And that’s really, really important. Why? Because if Katniss didn’t fail then there wouldn’t be any story here. 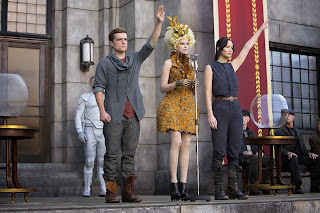 If Katniss succeeded then it would be her and Peeta against the world still. She would still be able to lean on him, be able to take comfort in him, and be able to believe in his moral superiority. If they were together, then they would go into situations together. They would be used by the media together. And Katniss would never have to figure out who she is. The thing that I think we all forget in this story, because Katniss is so prepossessed, so sure of herself, is that Katniss doesn’t really have a strong sense of personhood. She defines herself first in relationship to her family, then to Peeta, then to the Capitol, and then to the revolution. But in the end, Katniss has to define herself in relation to her own actions, and that’s when she figures out who she really is. You have to be alone to hear your own voice sometimes, and that’s true of her here. Katniss needs to lose Peeta so that she can save him. It’s funny. I actually saw this film with a couple of friends, two of whom are actually the movie’s intended audience. By that I mean that they are teenage girls, and perfectly okay with that fact, thank you very much. At the end of the movie, one of them complained to me that the movie was so faithful to the book. I pointed out that I tend to like this in a movie, but here, she complained that she wanted a happier ending. More resolution. She wanted Peeta to not be gone. And that’s a fair point. We crave resolution. If there’s one thing I didn’t enjoy about the movie it was the very end, when you realize that you’ve got another year before you get to see how things turn out. But, and I wish I had thought to say that at the time, that is a good thing. That sense of unrest, unresolved-ness? That’s good for you. You have an entire year to spend thinking about the end of the movie. An entire year wondering if Haymitch and Finnick and Plutarch Heavensbee (Phillip Seymour Hoffman) did the right thing in getting Katniss out. A whole year to wonder what happened to Peeta. I mean, you could read the books, but it’s different to see it on screen. You have a year to grapple with who Katniss is if she fails, and a whole year to think about the cost of revolution. These are all good questions. These are all important questions. And these are all the kinds of questions we hate to ask. Why? Because they’re good for us. 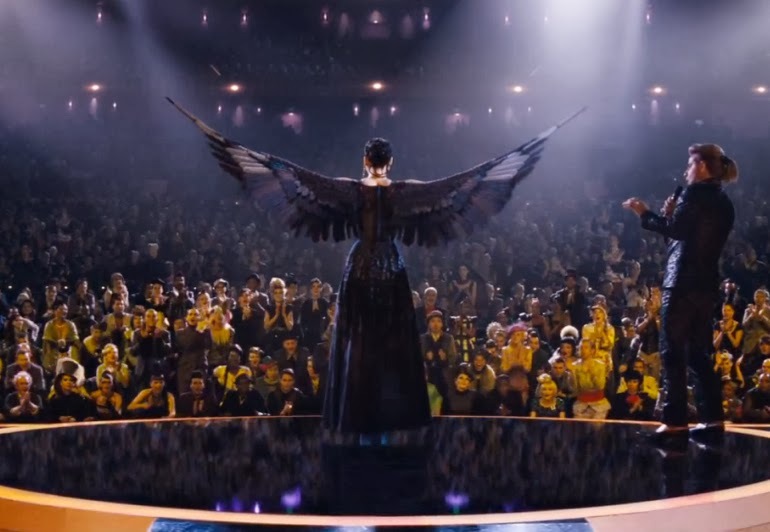 Rue still being held up as the face of innocence (I loved Katniss's speech there). (I remember the racist reactions to Rue with a distinct lack of fondness). Second, the media-dipshit-woman (Effie?) losing her faith in the games over the course of the film, until she tearfully says sorry to Katniss and Peta. Dude, I love that Effie's character development made it into the movie. Her slow understanding of the cultural and personal implications of her role in society is touching and kind of heartbreaking. So good. And also important. I don't really follow THG blogs, were fans upset that Rue was black or were they just surprised? To be honest, I thought she was going to be played by a little white girl since the books kept talking about how she reminded Katniss of her sister. It wasn't until I saw who was cast that I thought, "Oh, she reminded her of Prim's spirit/personality/essence." I had trouble with the books and movies because everyone kept talking about what a revolutionary Katniss was when everything she did was for the love of specific people and she didn't even know there was a revolution or if she wanted to take part in it until the final book. I almost stopped watching Catching Fire because Katniss's complete cluelessness was getting to me. It was understandable but it's not something you usually see from the hero of the story. So many fans fail to see that Katniss was less the leader and more the mascot/model of the revolution. She was used and manipulated from both sides while she just tried to survive and understand what was going on. She didn't know that there was special meaning in the song she sang when Rue died. She didn't know that there was meaning in the mockingjay pin someone asked her to wear. She didn't know so many of the other fighters were all ready to sacrifice themselves to make sure she made it. She would do something defiant without realizing it was defiant and the revolutionaries would work the heck out of it for their cause. So many fans didn't realize she wasn't fighting to change the game, she was just trying to survive it.